In S/4HANA 1610 a new functionality called ‘Attributed Profitability Segments’ is introduced. It is now possible to derive a (statistical) profitability segment when there is another real CO object with a settlement rule to COPA. I was hoping that this would fix some occurring issues with Account Based COPA in S/4HANA. Below, I will explain the scenario I have been dealing with in my example with a revenue bearing time & material service order which is billed with a debit memo. The debit memo request has an account assignment to the service order. The service order has an settlement rule to COPA. 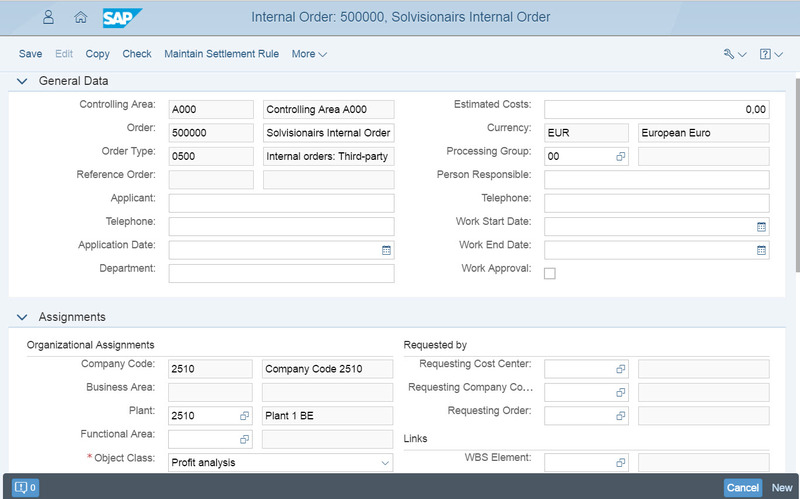 In this example I use an S/4HANA Finance 1503 environment. In my second example I will show you how the Attributed Profitability Segment in S/4HANA 1610 works. See the difference yourself and decide if you can benefit from this new enhancement. Here I will show you a time & material service order scenario and the reporting issues in Account Based COPA without having attributed profitability segments. 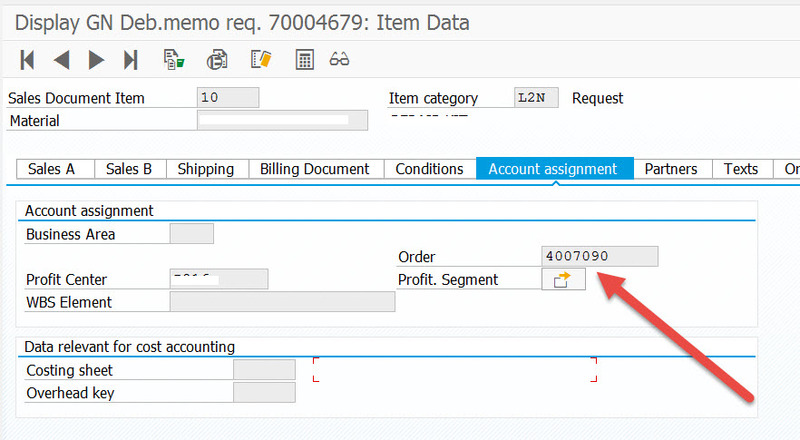 In the account assignment in the sales order line items you can see the assignment to the service order and no assignment to a Profitability Segment. This means that you cannot report on the Revenu in Profitablity Analsyis untill the Service Order is settled. Even then, you will see the revenue on the settlement cost elements, not on the original revenue cost element. 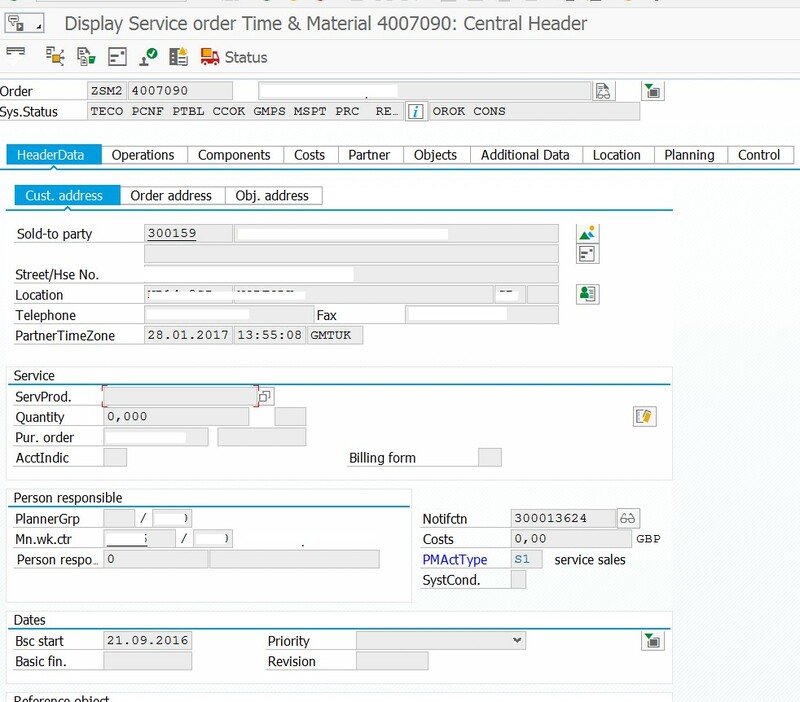 Let’s have a look on the data of this Invoice and service order in the ACDOCA table. The top rows in the blue rectangular are the actual postings on the service order (e.g. Revenue Accounts). The others are postings resulting from the settlement of service order (settlement cost elements). In this example I have my COPA characteristic Ship to Party and Ship to Country. As you can see these fields are not derived during the daily postings. They are only derived when the service order is settled to COPA. The result is that I don’t have my COPA characteristics on my revenue GL accounts. Reporting in COPA with the use of standard ACDOCA reports and KPI Fiori tiles will result in incomplete figures in these cases. Unfortunately the service order is not included in this list as object. Thus a direct solution for my scenario explained above has not been provided yet by SAP. I hope the service order will be supported soon as receiving CO object. However let’s see how this new functionality works with a supported object, the internal order. Technically it’s the same issue we are solving, but instead of the service order we use an internal order as account assignment. In the configuration I have activated the Attributed Profitability Segment for internal Orders only for postings on P&L accounts. As mentioned at the beginning of my post, I will use a S/4HANA 1610 environment in this example. The below internal order has an settlement rule to COPA. 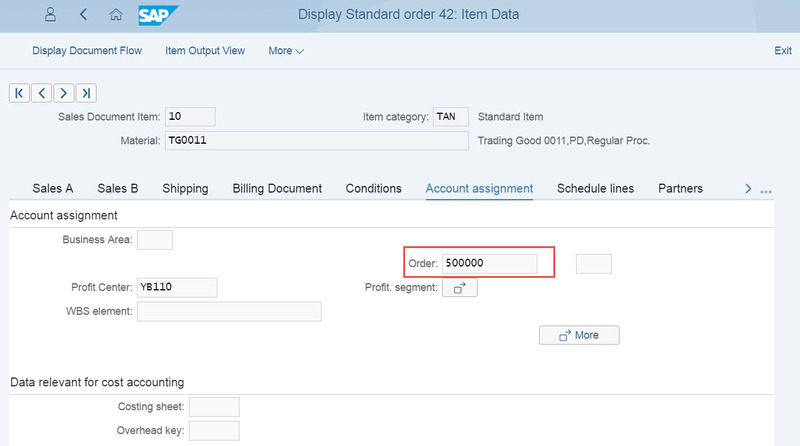 I create a sales order with assignment to the above internal order in the line item. As you can see there is no assignment to COPA. After posting the invoice you will see the attributed segment in the revenue line item in the ACDOCA table. The real CO account assignment can be found in field Object Type (ACCTASY) which is the Internal Order in this case. As you can see the COPA characteristics like the Material, Customer, Material Group, Customer Group and Ship to Party are derived as well! I see huge benefits in this new functionality for reporting purposes since profitability characteristics are derived directly at the moment of posting even if there is another CO assignment. For me it was a long awaited functionality, however I’m very disappointed that it isn’t working yet in scenarios were the service orders is the receiving cost object. I have addressed this to SAP and waiting for a reply. I hope you have enjoyed reading this and I wonder if you have experienced similar issues with CO objects as well? If you have other thoughts or questions related to this subject, please don’t hesitate to leave a comment. If there are any other S/4HANA related cases you would like to see, just let me know and perhaps I can write a future post on the topic. Update September 2017: SAP has released an OSS note to enable the attributed Profitability Segment functionality for Service and Maintenance Orders. By default this is not enabled in the releases S/4 HANA Finance 1605, S/4 HANA OP 1610 and 1709. Very unfortunate indeed that the service order is not included. Ga ik gelijk laten doen. Nice and clear explanation, very inconvenient issue as you can’t have real-time insight. Especially strange as FI reporting isn’t a possibility. 🙁 I blame my FICO consultant consultant. I am unable to locate the Actual Revenue KPI tile in the Fiori Apps Library that is referred to in your blog https://s4hanablog.com/tag/profitability-analysis/. Please could you confirm if this is a standard tile or one that you built? If it is standard, please could you give me the name from the Apps Library as searching by Actual or Revenue returned no apps that seemed like this one. If it’s a standard tile, please could you confirm which technical catalog it is in too? I was able to find the Market Segment Actuals easily. I wanted share with you an issue we identified in this area. I was wondering if you had come across this issue as well (and might have a solution). It’s about unit of measure recording for revenue postings on cost objects. We are on 1710 FPS02. In our design we use sales orders assigned to WBS elements. WBS elements are settled to account based CO-PA.
We’ve noticed that if we post billing document (to WBS element) unit of measure is not being updated in ACDOCA. It’s only updated if unit of measure is maintained in revenue GL master (cost element category 11) and unit of measure of material being sold is the same. That would require separate revenue accounts for materials with different units of measure (not really practical). Did you come across this issue? We logged this issue with SAP and it’s with development now. We’ll update you once we get a reply. Thanks for contributing to the forum. I assume your system version 1710 fps02 was a typo :). I’ve not come across this specific issue, but I know that there are some customizing steps in CO to add additional quantity and UoM fields in ACDOCA. Perhaps this part is missing in your system? I’m not sure. You can find this new customizing item in: IMG-Controlling-General Controlling-Additional Quantities. There is also a BADI to fill the additional fields, which you can find in this iMG path. I’m not sure if this is going to help you, but I’m anyhow very interested in the solution provided by SAP. So it would be very nice if you can post an update here. I’m in a S/4HANA project now that is using Project System to manage the project. I follow Best Practice to activate Account Based COPA only. Similarly, I assigned sales orders to WBS element. This WBS Element carries Revenue and Cost. I give Settlement rule receiver as PSG. But I hit error when I try to settle WBS elements to PSG via CJ88 after running RA via KKA2 . The system is asking for PA Transfer Structure for settlement. I understand that PA Transfer Structure will transfer from Cost Element to COPA Value fields. But we don’t maintain Value fields for Account based COPA. Really appreciate it if you can enlighten me on how to set settlement rule as PSG and settle to Account Based COPA. Appreciate your comments here too. 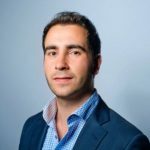 I hope our host Ugur has nothing against using his fantastic blog for resolving consulting issues :). I can’t see any flaw in your logic. Our settlement profile does not contain “PA transfer struct.” entry. And we settled to account based CO-PA without any problems. However we didn’t execute results analysis. That’s probably the only difference. Please let me know once you resolve it. Hi Alice, Szymon, first of all I wish you both all the best for 2018. It’s absolutely fantastic to see that this blog turns into a collaboration/discussion platform :). Unfortunately due to lack of time I’m not able to involve in all the discussions, but will try to contribute as soon as I have the chance. By the way, I recently gained access to a S/4HANA 1709 sandbox. Will try to write something. Do you have any suggestions on specific topics perhaps? All the best in the New Year! I’ve been working with 1709 since November. There are some nice new features in my area of expertise (Product Costing, Material Ledger). For example now it’s possible to report production costs on work centre / operation level. The maximum number of cost components is now 180 (used to be 40). But the quality of code is not that good. I had to log dozens and dozens of incidents. Hopefully upcoming SPs will sort it out. Thanks for the reply. Happy New Year to you!.It works now after I removed the “PA transfer struct.” value. Really appreciate it. I have another question. I’m working on S/4HANA 1709 now. Yesterday, I realised that PR that triggers from Network for a service material and converted to PO… WBS & Project definition are not populated into ACDOCA table. Any clue? Happy New Year to you too. Appreciate it if you can shed some lights on Financial reporting and Profitabilty reporting creation that based on ACDOCA table. I find that Office Analysis is more about pivot table reporting rather than reporting. I’m glad you managed to resolve the CO-PA settlement issue. With regards to the second issue. Can you please be more specific: are you talking about goods receipt posting against a PO? Yes you are right. WBS & Project definition are not populated into ACDOCA table upon GRN of the service material. Only Network number is populated. we have activates account based COPA. now attributed profitability segment feature is here. but when i am trying to use and analysis this feature. I am not getting expected result. as per my understanding if we use Attributed PA seg, in that case if we are posting FI entry on Cost center as real object and same time cost will post to COPA as statistical posting as we do not need to wait period end closing to see margin or profitability against my revenue posted copa on real time. i have done setting attributed PSG and marked Cost center category F and P/L account marked yes. as Controlling Area A000 and Account Assignment Category as CTR and Sale org 1010.
but when i posted document with some fi entry it posted to cost center as real but no posting on COPA as statistical. i think i am missing something here or i am doing correct. is there anything more needed to get desired output. Can you please help me here. I really did my best, but I don’t understand your requirement. You post actuals on a cost center and expect that the postings should appear on the attributed profitability segment? I don’t see the relation between your sales organization and the cost center. In your case, you are already directly posting to a cost center. There is no other object which is assigned to the cost center. You can already fill your PSG on the P&L account while doing the posting. Perhaps it will help when you describe your requirement first? Thanks for detail document, now we are implementing 1709, KE27 (Revolution of COGS) functionality is available in 1709? Thanks for your blog, very interesting. Small question to you or any members: did you made something special to have the customer / bill-to/ship-to to the Profitability Segment? We have setup a WBS with a settlement rule. Then we do a billing via SD on this WBS. The attributed probiltability segment works but it is unable to retrieve characteristics from the Sales Order (e.g. Sales Order number, bill-to…). Hi Walter, do you work with a multi level WBS or just 1 level? Attributed profitability segment functionally does not work with multi level WBS by default. Attributed profitability segment (APS) solution only works where, sender object (like Cost Center, WBSe, Internal order etc) should have one to one relationship with receiver object (Statistical PSG) means characteristics (like Division, Sales org, or any characteristics. means one cost center X should be posted only one division not more than one. then only it will post the data. if we have 2 or more received characteristics values then APS will not work. so SAP has to work on the provide further solution to APS work in multiple entries as receiver. also data posted using APS will not available for Top-Down Distribution. if we want execute the TDD then first you need to post data as real PSG using CO-PA Assessment then we can do the TDD. Great blog and the follow on comments and responses are extremely beneficial. I especially want to thank Alice for her comments. I’m working on a 1709 implementation now where Attributed Segments is turned on trying to generate the settlement rule for the WBS assigned to the SOLI has been a departure from what I did in 1610. In that scenario I was able to do CJB2 for the SO and bring over all the PSG characteristics into the WBS settlement rule. Then run KKA2, then CJ88. I will try the set up listed here to see if it works. Also I’m setting up the configuration for Event Based Rev Recognition. Uger or others, will there be a problem using both methods? APS for Single Site projects and KKA2/CJ8G for Multi-site projects where billing is done for each individual site? (plus Material/Labor needs to be split out in COPA. In 1610 I did that through the Settlement profile). NIce Blog, i have tried same internal order example, but its not working for me. i don’t understand what i am missing. I have activated that internal order in customization. I created an internal order with psg settlement rule and internal order linked to sales order. After PGI and invoice, in ACDOCA Table i am getting psg number but not the other characteristics like sales order and other derivation characteristics. Can you please give light or hint, what could i miss.